The photo id for this photograph is 83, in the Schools album. 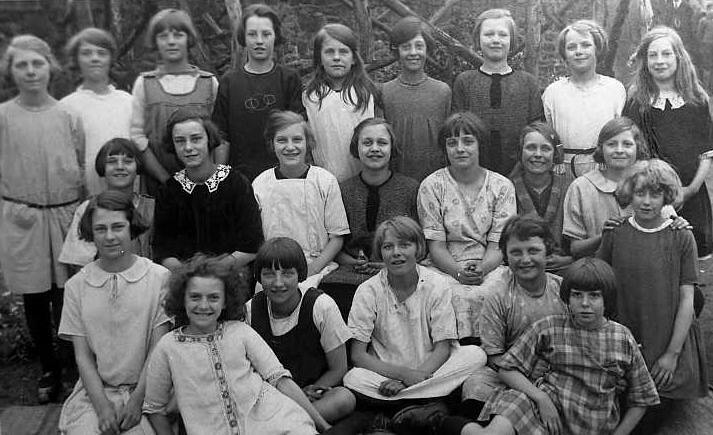 I thinks picture is a little later than 1925 as I believe that the young lady sitting in the middle row, hands on lap, third from right is Eileen Oscroft who was born in 1920. She appears in some of the other Whaley school photos as a younger child. I would have thought this picture would be around 1934 ish. You could well be correct. Some of the photos I have in my collection were of schools and various groups of people. These were shown at 'film shows' to an invited few in the 1970's/80's and the organiser, if he did not know the date of the photo simply had a guess. Near enough would do was his theory. The girl in the middle row, second from the left wearng a dark dress with a lace collar is my dear late mother Mrs. Ethel Vernon nee Platt.